Shared workspaces within the offices of advertising agency Canvas have partitions made of dichroic glass, which change colour when viewed from different angles. Located in the Playa Vista neighbourhood of Los Angeles, the project was completed by New York-based architects A+I. The new offices encompass 36,000 square feet (3,344 square metres) of open-plan workspaces over two floors that are split up by meeting rooms, informal spaces, and private offices. From the outset, the architects faced a blank slate. "The company had no purpose-built space that preceded this, no employee culture they were designing around and no identity yet to perpetuate," said A+I. Their challenge was to design for a young agency that was still defining its work culture. "How do you define a design for a company that has an expressed interest in remaining undefined? How do you create purpose-built space for working methods of evolving purpose?" the architects asked. The outcome is a flexible office that emphasises open workspaces, but intersperses them with more secluded areas for holding meetings or concentrating on specific tasks. At the centre of the plan is the "all hands space". This area is large enough to accommodate everyone in the firm, and the architects define it as a "a multi-purposed social, meeting, and event space". Different types of workspaces are laid out around this central gathering area. Because individual workstations were placed near the building's periphery, every employee has access to natural light. Collective spaces are denoted by bright partitions of dichroic glass. This material consists of a film coating that changes the colour of light passing through it. 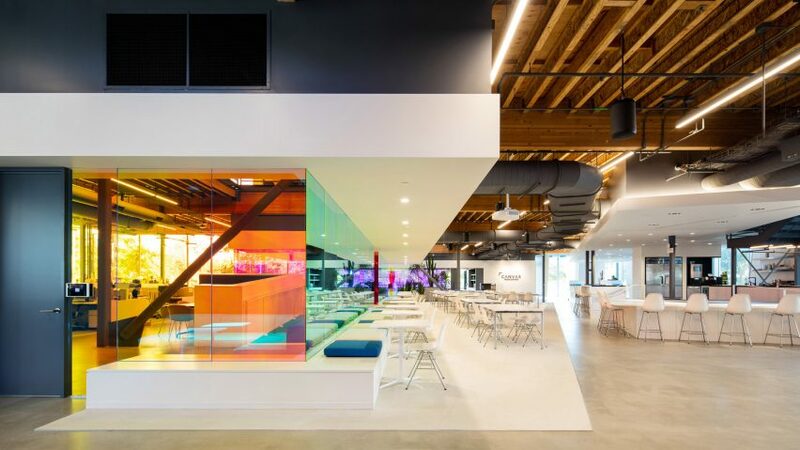 "Dichroic glass denotes collaborative areas in the centre of the space," the architects said. "If colour represents creative energy, the changing colours from varying vantage points as one moves through the space illustrates [...] the incredible surge of creative fluidity Canvas Worldwide strives for." The second level features a similar layout to the ground floor. Several openings in the slab allow for workers to peer into the spaces below. "The double-floor space features large vertical slab cuts that create extraordinary visual angles and spatial connectivity," said A+I. The studio has also created the New York offices for tech company Squarespace, which they completed in a mostly monochrome palette. Other workspaces in Los Angeles include a repurposed brick warehouse for environment-focused companies and offices with glowing partitions created by Tighe Architecture. Photography is by Michael Wells.